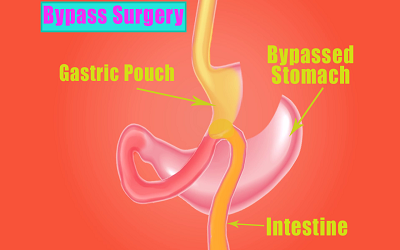 ‘Roux-en-y gastric bypass’ (RYGB) surgery procedure is a most common bariatric surgery procedure. And considered as ‘gold standard’ surgery for weight loss. In this kind of bariatric procedure, the upper section of stomach size reduces to the small size of the pouch. This upper part of the stomach staple off by a surgeon and then this small size of pouch linked directly to the small intestine (Roux limb). As compared to gastric sleeve surgery and gastric band surgery, an individual can lose weight more by ‘roux-en-y gastric bypass’ surgery (gastric bypass surgery). This surgery generally considered irreversible and have a higher chance in a shortage of vitamins than gastric sleeve or gastric band surgery. After consuming food, bypasses the rest of the stomach and the upper portion of small intestine. So, absorption of food fat and food calories decreases and also absorption of food minerals and food vitamins reduces. An individual who suffers from severe obesity then ‘roux-en-y gastric bypass’ surgery can help. If an individual has a body mass index (BMI) 40 or more then the surgeon may advise for gastric bypass surgery. Individual who have BMI between 35 to 40 and have health issues such as sleep apnea, high blood pressure, heart disease, or type 2 diabetes. This surgery can aid in an individual to lose excess weight about 100 pounds. For reversing type 2 diabetes, stopping heartburn and reflux it may play a good role. It lowers the risk of high blood pressure, sleep apnea, heart issues. The other name of this type of surgery is ‘minimally invasive surgery’ (MIS). In this way, 4 to 6 small cuts in the stomach will make by a surgeon. Then, a laparoscope (tiny camera) pass through one of these cuts by a surgeon. This laparoscope (tiny camera) link with a video monitor. For seeing inside the stomach, the surgeon looks at the monitor and use surgical instruments to do bypass surgery. These surgical instruments inserted through the other cuts. It is the traditional type of surgery and for this, a large surgical cut (6 to 8 inches) to open up stomach will make by a surgeon. Open surgery is still very common but now many surgeons perform the laparoscopic surgery. Open surgery chooses by some surgeons based on preference, and the technical issues of anticipation that may be encountered. Therefore, few small cuts require in laparoscopic surgery. So, in laparoscopic surgery, less pain, external scarring, and healing may be faster than in open surgery (traditional surgery). Individual needs to contact a dietitian, psychiatrist, internist, and a bariatric surgeon. A dietitian will explain about the required diet and drink. This is essential that individuals enroll in a bariatric surgery education program. This program aid in preparation for surgery and life after surgery. Medical history, physical exam, and order blood tests take place before surgery. If an individual is a smoker, he should break smoking at least 6 weeks before surgery and not start again after surgery. If individual use blood-thinning medicines (aspirin, ibuprofen, and other), then it is needed that he stops in the days before surgery. An individual should not eat or drink anything after midnight before surgery. There are several hours takes place during surgery. For no pain and sleep through the surgery, general anesthesia working during surgery. A surgeon will make some small cuts in the stomach and a laparoscope (tiny camera) insert through one of these cuts and other surgical instruments inserted through the other cuts. By a laparoscopic stapler, a small stomach pouch makes on the upper part of the stomach. After this, by using the stapler to divide the upper section of the small intestine into a tube with two ends. After this, small intestine (Roux limb) end links to stomach pouch, and a small connection (anastomosis) make between them. Another end is linked to another section of the small intestine. Then, upper endoscopy is used for the leak test. After 3 to 5 days of surgery, most patients relieve from a hospital. Before leaving the hospital, you need to discuss with a doctor about wound care, safe pain medicines. Patients also talk about that when he can start physical activity. Immediately talk to a doctor if you problems after surgery like- wound pain, leak fluids, hot to the touch, coughing or trouble to breathe, vomiting, and diarrhea, pain in the abdomen, pain in the chest, pain in the shoulder, pain in legs. In case of diet and drink after surgery, a doctor may suggest individual that he take liquids for the first 1 to 2 weeks. A doctor may suggest individual that he use soft food slowly and then regular food in a diet for about one month after surgery. The absorption of food nutrition and food vitamins affects in surgery and individual lost them. So for recovering these nutrition and vitamins doctor advise taking vitamin and mineral supplements. Weight loss surgery can develop nutritional and vitamin deficiencies and these deficiencies can produce anemia, osteoporosis, and metabolic bone disease. Individual may avoid these deficiencies by maintaining vitamin and mineral intake. An internal hernia can take place. In an internal hernia, the small intestine can be trapped and blocked. There are some complications also may include stretching of the pouch or esophagus, failure to lose weight, recurring vomiting and abdominal pain, inflammation of the gallbladder, blood clots in the lungs or legs, ulcers in the stomach or small intestine, bowel obstruction, and leakage through staples. Gallstones can be developed and these gallstones can be avoided with bile salt supplements. This supplement used for the first 6 months after surgery. In surgery, dumping syndrome takes place. In the situation of dumping syndrome, certain foods and drinks may cause abdominal cramping, diarrhea, nausea, weakness, and sweating. It needs that individual doesn’t consume high sugar or high-fat foods because these make the dumping syndrome more badly. For a solution of dumping syndrome, an individual should contact a registered and experienced dietitian. By ‘Roux-en-Y Gastric Bypass’ Surgery, an individual suffers from reduced absorption of iron, folate, calcium, thiamine, copper, zinc, vitamin A, vitamin D, vitamin B12. So, for recovery of these vitamins and nutrition, healthcare team advice that individual use appropriate supplements. Therefore, it expects to an individual that he enrolls in ‘Roux-en-Y Gastric Bypass’ Surgery education program. An individual should contact all healthcare team and ask them all doubts about surgery. It is recommended that individual strictly follow all instructions and prescriptions of a healthcare team.